Footi Mosque or masjid as it called in Urdu is an unfinished work of Nawab Sarafaraz Khan. It is located at a distance of a mile from Hazarduari Palace. Though unfinished the mosque has some unique architectural features that attract tourists to this spot. It is said that Sarafaraz Khan built this structure in one night. 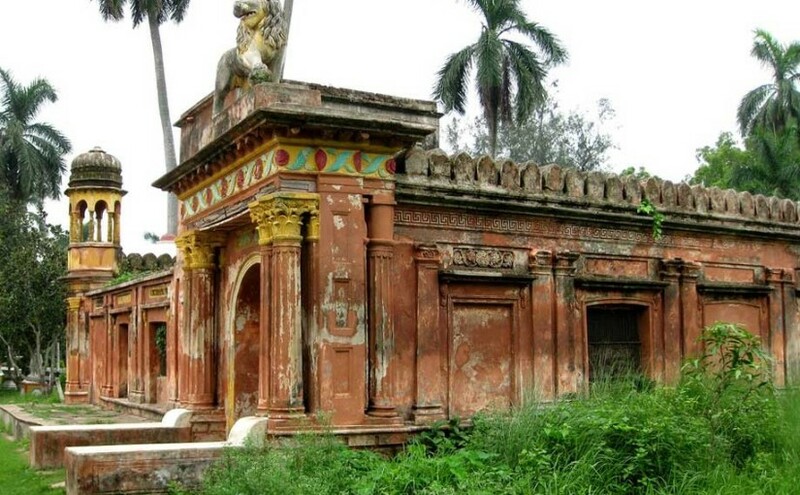 The Kathgola Palace built in the garden premises of Raja Dhanpat Singh Dugar and Lakshmipath Singh Dugar is located in half a km South-East part of Mahimapur (modern Nashipur) town in Murshidabad. It is an impressive structure constituting a central drawing room, a library, billiard room, bedroom and dining room. Built during 1870s as a rest house amidst the garden it has porches on all 4 sides. The pool sides are beautiful providing natural ventilation. The fantastic view of the countryside from the second floor will mesmerize you. Also there is the Adinath Temple which is of immense importance to the Jains. According to Holiday HotSpot, Nasipur Palace, old name Mahimapur Raj Bari is one of the primary attractions of Murshidabad which generally brims with visitors. Constructed in 1723-24 by Murshi Quli Khan this imposing structure has high minarets, huge domes and also a cemetery of the Nawab just below the staircase. Ramachandra Temple, one of the largest temples in Murshidabad is inside the palace compound. 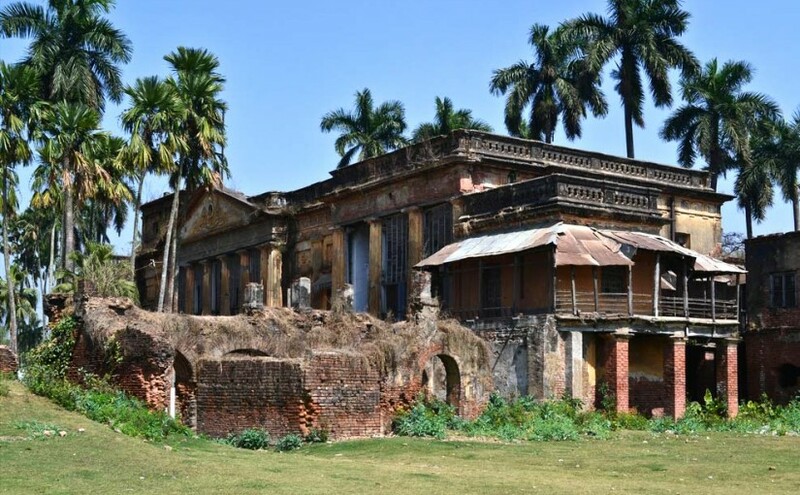 The Nasipur Palace is only 1.5kilometers from the Railway station on the Berhampore-Lalgola route. 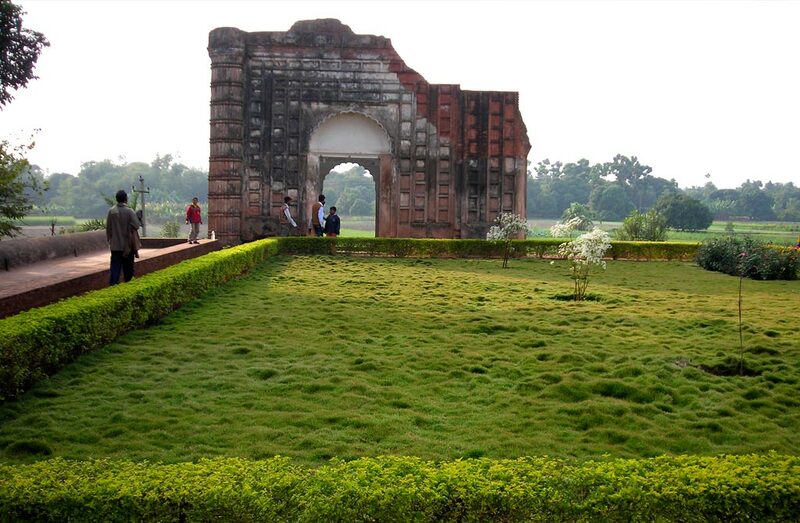 Nimak Haram Deori is the main gate leading to Mir Jafar, the traitor’s palace Jafargunj. It is located at a distance of only 1 kilometer north from the magnificent Hazarduari. Visitors cannot enter into the palace as it is well guarded. This palace stands as the memorial of the darkest hour in the history of Bengal as Nawab Siraj-ud-Daulah was killed here in an act of the betrayal. This assassination was decisive in the colonization of Bengal and India. The battle ground of Plassey lying on the banks of the Bhagirathi River holds lot of historical significance. 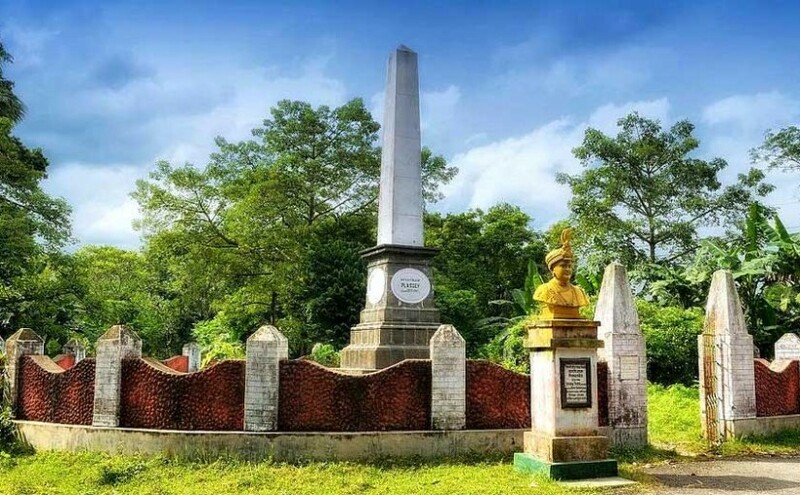 The British East India Company defeated the last independent Nawab of Bengal Siraj-ud-Daulah in the Battle of Plassey on 23 June 1757 which decided the fate of Calcutta and India. The British built the war memorial in the same year and the statue of The Nawab was erected by West Bengal government in the recent times. Mir Jafar, the commander-in-chief of the Nawab’s army betrayed him by accepting bribe from Lord Clive sealing the fate of slavery for Indians for the next 200 years. This mosque is located inside the premises of Khoshbag which is the final resting place of the Nawabs belonging to the Afshar dynasty ruling Bengal. It has the tombs of Nawab Siraj-ud-Daulah, his wife, grandfather and grandfather’s mother. Located on the west bank of Bhagirathi River, this is a famous toursist spot. The cemetery of Siraj-ud-Daulah or Khoshbag as it is popularly known as is located at the Bhagirathi River bank in the west. The tomb is also shared by his wife, Lutf-un-nisa and his grandfather, Alivardi Khan. Basically Khoshbag is home to the tombs of Nawabs from the Afshar dynasty. Khoshbag covers an area of 7.65 acres of land. This is a prime holiday hotspot and thus secures a permanent place in other listings on the most notable tourist attractions in Murshidabad. Moti Jheel, literal meaning Pearl Lake is a charming horseshoe shaped lake located 1 kilometer south of Lalbagh. The land adjoining Moti Jheel witnessed the celebration of Lord Clive after he acquired Bengal, Bihar and Orissa in 1765. It was also home of Warren Hatings during his tenure as Political President at Nawab Nazim’s durbar in 1771 AD. Moti Jheel is also referred to as the ‘Company Bagh’ because it was occupied by East India Company for a long time. Holiday HotSpot has also found out that the only existing building in the area is the Shahamat Jang. Jahankosha canon also known as the Great Gun, exactly means the “Destroyer of the World” weighing 16,880 lb is 17.5 feet long with a girth of 5 feet at the touch hole end. The diameter of the touch hole is 1.5 inches and the diameter of the orifice is 6 inches. 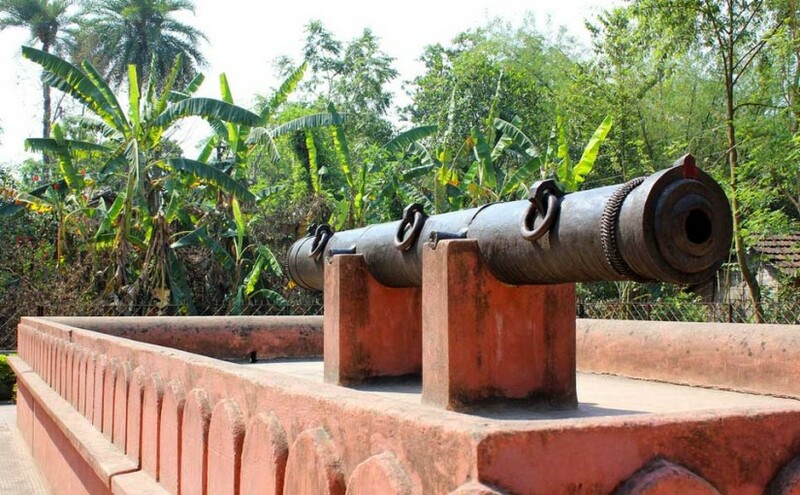 The celebrated canon is located at a short distance of 1 kilometer from Katra and was constructed in the 17th century by a craftsman named Janardan Karmakar belonging to Dhaka. There is a mosque named Kadam Sarif close to the canon which is said to house the replica of Hazrat Mohammad, the Prophet’s footprint. The cannon is maintained by the Archaeological Survey of India. Cossimbazar, also known as Kasimbazar or Kasim Bazar, is a census town in the Murshidabad district of West Bengal. The settlement lies on the riverbanks of Bhagirathi. 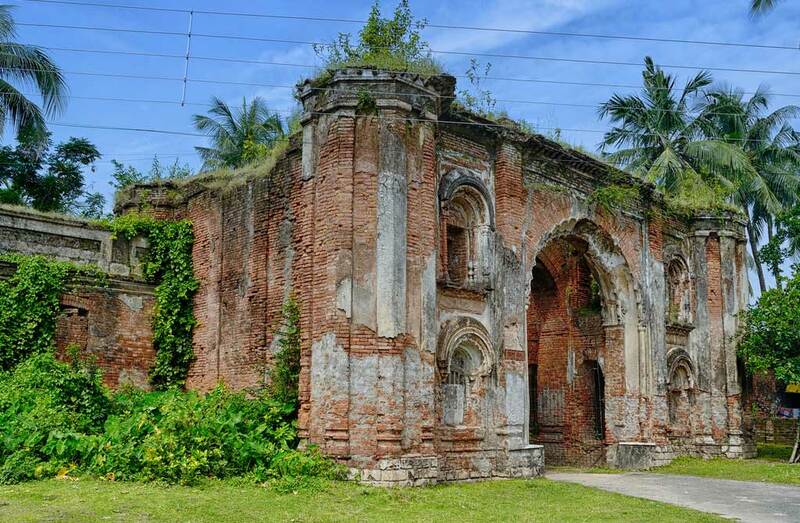 In the past, the place formed a part of the Berhampore municipality. The number of people living in Cossimbazar in 1901 was only 1,262.